Rehabilitation is for everyone regardless of the sport you participate in or the level of your involvement. Injuries can be sustained in any sport or recreational activity such as walking, mountain biking, skiing or bowling. It is important to completely rehabilitate after injury. A recreational athlete or weekend-warrior can benefit from physiotherapy to rehabilitate a sport injury as much as a professional or Olympic athlete would. The physiotherapists at Kamloops Physiotherapy and Sports have obtained advanced post-graduate training in the assessment and rehabilitation of sport and orthopedic injuries. We can help you achieve a successful return to the highest level of pre-injury activity… often to a level higher than before you were injured! At Kamloops Physiotherapy and Sorts Injury Centre, your therapist will complete a full history and thorough assessment that will identify the injured structures and possibly uncover reasons why you injured the area in the first place. This information can then be integrated into a comprehensive treatment and exercise program designed to address your specific problem areas and guide your successful return to your activity. Loss of strength, range of motion, balance and proprioception may appear soon after injury occurs. Failure to correct each of these factors may lead to prolonged and persistent pain, a greater likelihood of re-injuring the area and the possibility of injuring another part of your body. Don’t let an injury get in the way of doing the exercise you need and the sport you love! When is it safe to return to sport after ACL surgery? When is it safe to return to sport after a concussion? Will Physiotherapy help plantar fasciitis? You can also work to avoid an injury from ever occurring by doing ‘Prehabilitation”. This consists of an assessment to find joint or muscle problems which if left untreated, may predispose you to injury. Using exercise to correct hidden muscle weakness or endurance, poor flexibility, asymmetry or poor control can help decrease the chance you will get a sports injury. Prehabilitation may also allow you to excel in your chosen sport or begin your training the best way for an activity that you have never done before. Who qualifies as Sport Physiotherapist? A ‘Sport Physiotherapist’ is a Physiotherapist who has completed training and achieved a Certificate or Diploma in Sport Physiotherapy through Sport Physiotherapy Canada SPC (a Division of the Canadian Physiotherapy Association). The Diploma holder has experience in the care of athletes of all levels, be it the high performance national or provincial level athlete or the everyday active Canadian. 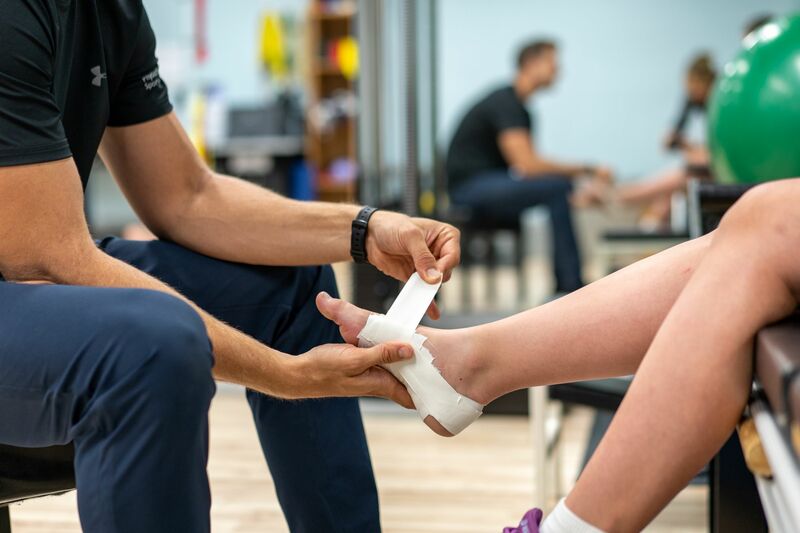 The Education system of SPC allows the graduate physiotherapist to gain experience and education through courses in areas such as athletic taping, protective equipment, emergency care, concussion management and exercise prescription. Physiotherapists gain valuable field experience towards their Diploma by working closely with experienced therapists in a mentorship program. The Sport Physiotherapist is qualified to work with Canada’s High Performance athletes in all settings including daily training and competitions such as world championships and the Olympic Games. Written and practical Examinations are required to achieve the level of Diploma holder ensuring a high standard of care.